A feminist’s perspective: echoes of forbidden love and family violence rebound in this narrative. After years of living in England, Marie returns to the family home in southwest Australia, to a father whose destructive impulses have been curbed by a stroke and to a mother whose passivity Marie never understood. Behind her is Edy and the deep love they shared before he left, suddenly and without explanation. Even further back still is Marie’s memory of her father and his fraught relationships with his mother, brother, and stepfather. Yet, when Edy follows Marie back to Australia, her father’s shocking revelation brings hidden things to the surface. 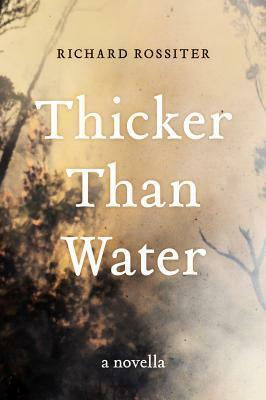 Thicker Than Water is quintessential Richard Rossiter fiction: an intense, poetic, family drama, as well as a psychological tragedy. This is a small book that punches well above it weight. If you are expecting a light easy going read you are mistaken for this is a story of deep sadness and intense emotions that shares more than a hint of feminist awareness in its discussion of love, attraction and domestic violence. Domestic/ family violence does not necessitate the act of physical violence; power over, control, are just as violating and debilitating as physical violence as the relationships between Kenneth and his wife, Helena and Kenneth and his children demonstrates. This relationship only just starts to tip in the favour of Helena when Kenneth’s power is reduced by a debilitating stroke. For a short while at least Kenneth needs her help. And that of his daughter. I wonder why Marie bothered – he has treated her and her brother appallingly. Is it a sense of duty? Kenneth’s arrogance and brutality are unforgivable – throwing both his children out of the family home because they choose to exert free will and then to insist Maire have a birthday party at home only to cancel it on the day of the party; how sadistic. Just a few examples of Kenneth’s true nature. I did not like this character. Through the narrative we are aware that there are family secrets and as each one is slowly revealed we think we know where this story is heading, what the big reveal will be. But you will be wrong and you will shocked and you will be outraged. This is not how you wanted this story to end. It is not fair. And it is painful. And the ending begs the question – what would you do in these circumstances? The Margaret River Bookshop is launching this novella tonight – will you be there? This entry was posted in Contemporary Fiction, Post Script: Book Reviews and tagged book launch, family secrets, family violence, local book author. Bookmark the permalink. Wish I could be there Carol, is this your first official review for them? I have posted a few reviews on the bookshop site – but this is one of the books that the bookshop kindly provided me with. The bookshop is a big supporter of local writers thus I am extending my reading habits. This is the first bookshop event I am attending. This sounds like an interesting book. One that would stay with you after you’ve read it. Not an easy read either. Carol – This sounds like such a thoughtful, powerful book. Perhaps not a light read, but definitely a good one, so it sounds. And one that the sense of place is very clear Margot.